Total excuse for a post today. My glasses had a fall and I need to have them looked at so am unable to type for more than a minute or two. I made this flower way back. The stem was a wax drinking straw with the bendy part close to the flower was covered in felt. The yellow centre of the flower was fabric paint. Now off to sort out my eyes! 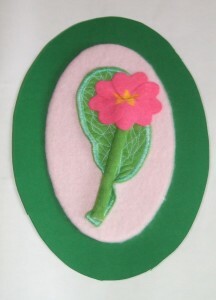 This entry was posted in Crafts on February 17, 2010 by Grannymar.